As signage and printing technology approach technical parity, Big Ideas have fully embraced in-house digital sign printing. With superior large format digital printers, pre-press and colour control, along with enviro-friendly latex print technology, Big Ideas provides a full end-to-end digital signage printing solution. Digitally printed signage allows you to create a more engaging environment for your customers, and design dynamic promotional signage quickly. Digitally printed signage can be used for exterior signage, applied to walls and windows, used to wrap your company vehicles or even applied to your roof or floor. 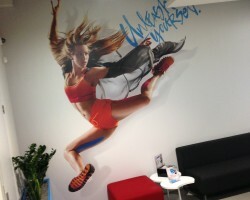 There really are no limits to the potential of digital print signage, except imagination! Don’t just put a sign up outside and open the doors – set a scene with digital sign printing! Make use of blank office walls and empty retail floor space, with high quality digital prints to create an environment that excites your customers and welcomes your staff the minute they walk through the door! Window signage presents a fantastic signage and branding opportunity, and with digital sign printing we can unleash the full creative potential of colour and different vinyl combinations. 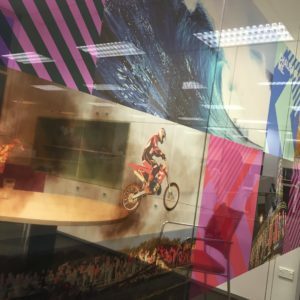 Digitally printed window signage – Graphics are digitally printed onto optically clear 3M vinyl, or onto a range of frosted film and translucents. Patterned frosted films – Take frosted film to the next level with electro-cut patterns on various frostings and vinyls, and combine with digital print for extra creativity. 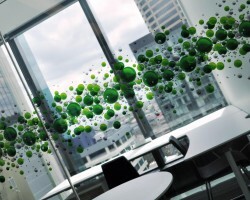 Window frosting – We can install frosted film or vision strip to meet OHS guidelines and create privacy in offices. Choose from a wide range of colours and textures. We’ve even created video-based window signage – so talk to us about what you want to achieve with your window signs! As well as full service large format digital printing, we can digitally print business cards, stationery and flyers, A0 plus posters, wall graphics, window graphics and point of sale material to support your campaigns.